This is an important and timely review. 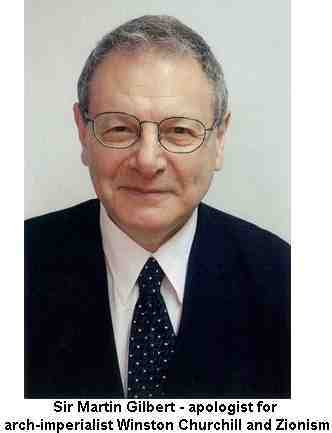 Martin Gilbert is one of the Establishment's favourite court historians. The official biographer of Sir Winston Churchill and a key member of the British historical establishment. The fact that he was appointed by Gordon Brown to the Chilcot Inquiry into the Iraq War demonstrates that he is a reliable and trusted ally of the powerful, since the Chilcot Inquiry was set up to exonerate not to analyse the real causes of a war that killed more than 1 million people. He has also, repeatedly, defended Churchill from well-known accusations of racism and anti-semitism, not least over the failure to bomb the Auschwitz/Birkenau extermination camp. 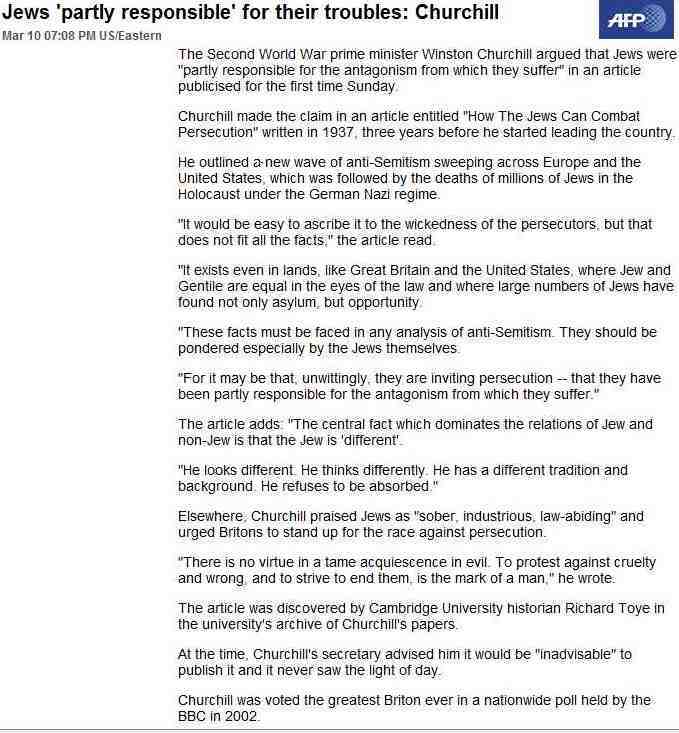 As Michael Cohen of Bar Ilan University shows in his article ‘Churchill and the Jews: The Holocaust’ Modern Judaism, Vol. 6, No. 1. (Feb., 1986), pp. 27-49, the famous Churchill memorandum of 7.8.44. to Eden: '‘Get anything out of the Air Force you can and invoke me if necessary’ concerning the bombing of Auschwitz was nothing more than a passing moment. There is no proof that he ever followed this up or in fact did anything more. Whereas British bombers flew over 180 missions to relieve the Uprising of the Poles in Warsaw, losing about one in six planes, there was no attempt ever to bomb Auschwitz (although it was hit by mistake) despite the fact that it was also the centre of vital coal to oil, rubber and other industrial production facilities and was regularly attacked by Allied bombers. It was well within reach of bombers from Italy. It was not heavily defended and the gas chambers and crematoria, to say nothing of the railway lines, could easily have been bombed. But Gilbert prefers to defend Churchill. No doubt he was shocked but there is no evidence he actually did anything apart from writing the above memo, whereas when it came to the Warsaw Uprising and the future political complexion of the Polish state he was extremely hands-on and concerned. He took a minute interest in the support that Britain could give (Stalin for the opposite reason refused to extend any help to the Polish resistance). "It would be easy to ascribe it [anti-semitism] to the wickedness of the persecutors, but that does not fit all the facts," the article read. "It exists even in lands, like Great Britain and the United States, where Jew and Gentile are equal in the eyes of the law and where large numbers of Jews have found not only asylum, but opportunity. "These facts must be faced in any analysis of anti-Semitism. They should be pondered especially by the Jews themselves. "For it may be that, unwittingly, they are inviting persecution -- that they have been partly responsible for the antagonism from which they suffer." The article adds: "The central fact which dominates the relations of Jew and non-Jew is that the Jew is 'different'. "He looks different. He thinks differently. He has a different tradition and background. He refuses to be absorbed." Churchill's main interest was what was to happen post-war. He was no anti-fascist. Indeed in Greece he put Nazi collaborators in power in Athens, after the Nazis had been defeated, in order to prevent the Communists take power. He took a minute interest in the support that Britain could give to the Warsaw Uprising (Stalin for the opposite reason refused to extend any help to the Polish resistance). His exoneration of Churchill should be seen in the light of his role as Churchill's official biographer, i.e. privileged access to files. Gilbert has also done his best to gloss over Churchill’s anti-semitism and racism. As he notes, Gilbert is not an analytical historian and it is easy to take out of context individual outrages and magnify them. It is a fact, as Marion Woolfson [Prophets in Babylon - Jews in the Arab Lands] and David Hirst [The Gun & the Olive Branch] have shown that such was the attachment of Iraqi Jews to stay in Iraq after 1948 that Zionist agents took to planting bombs outside cafes frequented by Jews and even the Masuda Shemtov synagogue in Baghdad. It is also a fact that the Maghreb in particular was a safe haven for Jews escaping the Inquisition in Spain. And Shlaim cites Bernard Lewis, somewhat surprisingly, as an ‘eminent Jewish scholar’. That he may be, but he is also one of those who distorts the record of Jewish-Arab relations. His attempts to show that the Free Officers’ Group, of which Nasser was integral to, was pro-Nazi when quite the opposite was the case, if anything it was leftist-nationalist, was slated by Gilbert Achcar in his recent ‘Arabs and the Holocaust’ which I have a number of criticisms of. Likewise Lewis’ attempt to portray another propagandist Stefan Wild as ‘objective’ is the object of Achcar’s scorn. But this is an interesting review regardless. The Jews have a fair claim to be the most persecuted minority in human history. Salo Baron, the American Jewish historian, coined the label “the lachrymose version” for the conventional accounts of Jewish history as a never-ending chain of discrimination, degradation, persecution and suffering, culminating in the Holocaust. In his new book, historian Martin Gilbert tackles a relatively neglected but fascinating subject: the history of the Jews in Muslim lands. The end result, however, is essentially an extension of this lachrymose version from Europe to the Near East. The book is ambitious in scope, covering 1,400 years of Jewish-Arab history. The narrative covers the period from the rise of Islam in the 7th century to the present day. It includes the fraught relationship between the Jews of Medina and the Prophet Muhammad, the Crusader conquest of the Holy Land, the Ottoman Empire, the impact of Zionism in the first half of the 20th century and the creation of Israel in 1948. The emphasis throughout is on the fundamental uncertainty of life under Muslim rule: the dual prospects of opportunity and restriction, protection and persecution. Jewish life under Muslim rule naturally invites comparison with that under Christian rule. Here Gilbert quotes with approval the eminent Jewish scholar Bernard Lewis, who concluded that the situation of the Jews living under Muslim rulers was “never as bad as in Christendom at its worst, nor ever as good as in Christendom at its best”. Lewis observes that “there is nothing in Islamic history to parallel the Spanish expulsion and Inquisition, the Russian pogroms, or the Nazi Holocaust”. But he goes on to point out that there is nothing in the history of the Jews under Islam “to compare with the progressive emancipation and acceptance accorded to the Jews in the democratic West during the last three centuries”. Gilbert is an anecdotal historian, not an analytical one. He has produced a lively chronicle of the Jews in Muslim countries from Morocco to Afghanistan. He has rich materials at his disposal and he is attentive to the human voices of individuals. But his account is both highly selective and narrowly focused on the Jews. What is missing is the wider political, social and economic context to enable the reader to place the Jewish minority in each Muslim country within its proper historical perspective. Some examples of Muslim openness, tolerance and courage are given by Gilbert. The bulk of the book, however, consists of examples of Muslim hatred, hostility and cruelty towards the Jews. Nowhere is Gilbert more strikingly one-sided than in his account of the consequences of the 1948 Arab-Israeli War. In the course of this war, the name Palestine was wiped off the map and 726,000 Palestinians became refugees. In its wake, around 850,000 Jews left the Arab world, mostly to start a new life in the newborn State of Israel. For Gilbert, these Jews are simply the other half of the “double exodus” and he persistently refers to them as “refugees”. With few exceptions, however, these Jews left their native lands not as a result of officially sanctioned policies of persecution but because they felt threatened by the rising tide of Arab nationalism. Zionist agents actively encouraged the Jews to leave their ancestral homes because the fledgling State of Israel was desperately short of manpower. Iraq exemplified this trend. The Iraqi army participated in the War for Palestine, and the Arab defeat provoked a backlash against the Jews back home. Out of a population of 138,000, roughly 120,000 left in 1950-51 in an atmosphere of panic and peril. I'm surprised that you're surprised by Shlaim having messed-up analysis. He screws up constantly, he's not really remotely a leftist. What were your issues with The Arabs and the Holocaust? 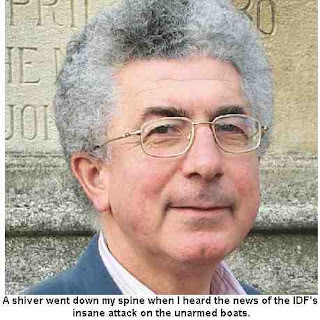 I don't think that Avi Shlaim has a messed up analysis. That doesn't mean I agree with all that he writes but he is a very good historian. Achcar's book is a mixed bag. There are some good things and I agree with his analysis of how there isn't an undifferetiated holocaust denial and that one must distinguish between European neo-Nazism and the reflection, among the Arabs and other third world peoples, of those views. As I'm writing a review at the current time I'll leave my criticisms, which are quite a few, until publication! So how many Jewish holocausts were there? I thought it was only one but I do understand the need for an Islamic one in order to justify Israel's treatment of the Palestinians. And by the same token Joshua's wiping out of Amalek and the Canaanites was the Arab holocaust? For every anti-Jewish remarks in The Quoran there are dead racist remarks against non-Jews in The Talmud. Strange though how the Christian bible has now disappeared from the pantheon of villany! Speaking of Winston Churchill, wasn't his mother a Jewess which made him half jewish? I definitely read this in a newspaper article but not sure if it was true. Even the Traffic Lights Discriminate! What is Apartheid if not Zionism and Israel?